What is a skeleton? It’s a working boiler-plate extension. 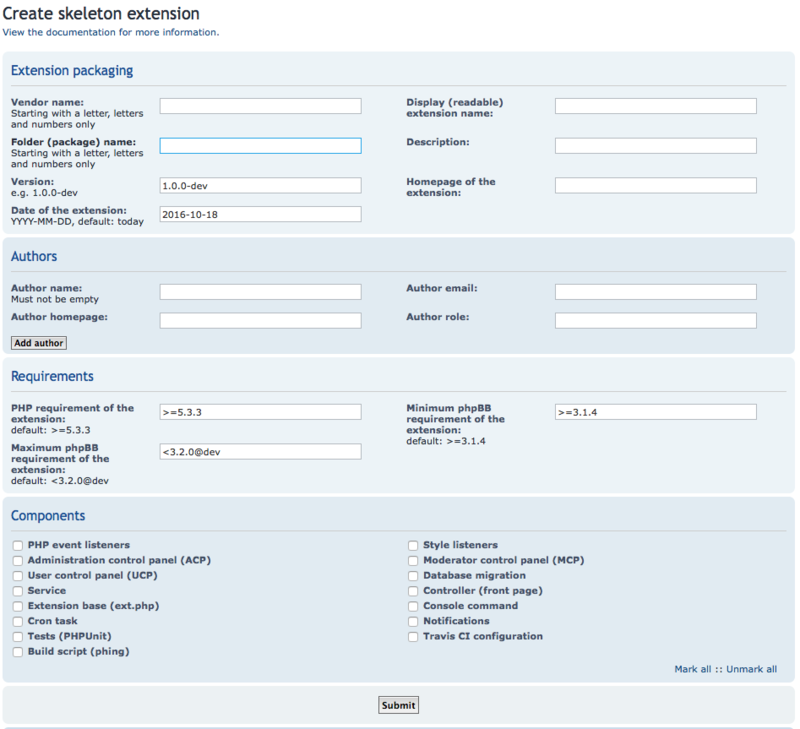 When you want to begin development on an extension, creating a skeleton will generate most of the initial files you would need, so you don’t have to. This means you can jump straight into writing code for your extension, and bypass the mundane task of creating the initial files, methods and docblocks yourself. A phpBB board, version 3.2.0 or newer. The Skeleton Extension generates working classes and methods which are intended to make the skeleton nominally functional and, more importantly, instructional. This documentation will assume we are creating the Acme Demo extension, with the vendor/package naming structure: acme/demo. Most file, function, class, table and variable names will be populated with the vendor and package names specified. The skeleton generated is only a starting point! You should always review the skeleton code you generate and update, edit or remove any of the code you do not need as you begin to develop your extension. Permissions can be used to grant users, groups and roles access to specific extension features and functionality.